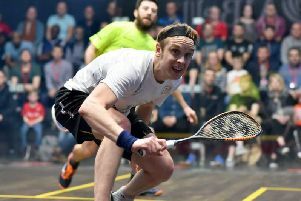 YORKSHIRE’S James Willstrop admitted to feeling “great” after reaching his first PSA World Series semi-final for two years. The 33-year-old world No 19 navigated his way through a tough last eight encounter with South Africa’s Stephen Coppinger at the 2016 Delaware Investments US Open on Wednesday night. The former world No 1 hasn’t reached the latter stages of one of the world PSA Tour’s most significant events since undergoing surgery on a potentially career-ending hip injury in the summer of 2014. But at Philadelphia’s Drexel Universoty he showed signs that he is returning to his the klind of form that took hjim to the top of the workld rankings, recovering from a slow start to put together a standout performance and come through 11-9, 5-11, 11-8, 11-3 in just under an hour. “I feel great right now - it’s such a pleasure to be out here at the US Open and to reach a semi-final again feels very good,” said Willstrop. “Each player on Tour is so different these days. I played well against Omar (Mosaad world No 3) in the first round but it was a completely different type of test again today. Stephen puts so much pressure on you and he was getting onto everything I played - so I had to think of ways to switch him and move him around. “I had to be very clear in what I was doing to open up the spaces and at 1-1 there it was becoming a real battle - it was definitely a tough, tough match. It’s such a pleasure to be out here at the US Open and to reach a semi-final again feels very good. Willstrop’s reward is to now face World No 1 Mohamed ElShorbagy - the man he defeated during the 2015 World Championship - for a place in the final after the 25-year-old Egyptian defeated his younger brother, and World No 6, Marwan, in straight games. “To be able to finish 3-0 today is lucky because mentally it’s tough for us on there,” said ElShorbagy. Sheffield’s Nick Matthew will be hoping to join Willstrop in the semi-finals when he takes on No 2 seed Gregory Gaultier in the second set of quarter-finals on Thursady night.